His name was Jean Moreau. He was fifty years old and lived in Becancour, Quebec. I know because I still have the newspaper clipping about him taped into a scrapbook. Below I wrote “Tough day at the office.” Reading the clipping now makes me cringe. Reading my own line helps me deal with it. Another story from the archive; the mountains can be harsh. If it’s your turn to cook, the day flies by, but there is little time to enjoy it. Sometimes, the weather is ideal, but you get lost in the mayhem of ten loaves of bread, eight lasagnas, and enough vegetable soup to feed one hundred hungry hikers. Sometimes, your only glimpse of the sun is through steamy kitchen windows. When that happens, all you can do is grit your teeth and think of the idyll just outside the door. High in the White Mountains of New Hampshire, there are a series of eight huts, spaced evenly along the Appalachian Trail, that provide lodging and meals for overnight backpackers. Lakes of the Clouds, the flagship hut, is perched on the col between Mount Washington and Mount Monroe, in the heart of the Presidential Range. Washington, at 6,288 feet, once held the record for highest recorded wind-speed at 231 miles per hour and is known for savage weather and grueling hikes. Still, in the summer, the hut fills to capacity each night, and it is the hut crew’s duty to feed them and provide cordial guest service. The forest is uniform and mundane—endless acres owned by paper companies, pine trees in perfect rows, awaiting their demise in some mill farther south. For a while, we see more ATV’s than cars. The road slowly unspools, and we pass few homes or buildings of any sort. A trailer appears here, then a gas station with old pumps and boy on his four-wheeler refueling. What we’re doing isn’t, in the strictest sense, legal. The United States has banned distribution of the worms. In fact, the man who shipped the worms was forced to flee in the night as the FDA was closing in. He now lives in England, but is hoping to move the business to a tropical climate so that the worms feel more at home. It took a few months to find someone we knew in Canada that was willing to accept such an unusual package, but finally our mom relented and gave up the name of her old friend Angela. Malcolm can convince anyone. It’s a somewhat suspect itinerary though, so as we approach the border, we plan our story. A long hiatus deserves a great post. Here is part 1 of a story that I’ve worked and re-worked. I like it quite a bit, hopefully you do too. This one is a tad long; I’ll split it into 6 parts over the next week or so. Happy New Year! 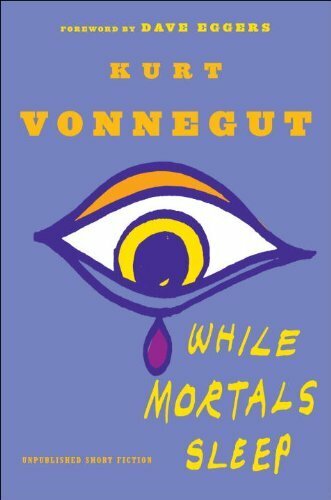 While Mortals Sleep by Kurt Vonnegut, Jr.
Kurt Vonnegut, Jr. has a unique style. If you’ve read him, you know this. If you haven’t read him, do so. I’ve read the bulk of his books at this point, and I was pretty glad to pick up While Mortals Sleep, a posthumous collection of previously unpublished short stories. I’ll admit, they are fairly similar to his other short stories (my favorite collection being Welcome to the Monkey House), but that’s not meant to be a criticism.